Poker is packed with drama, so it’s no surprise the popular casino game is the underscore of many successful films. This movie serves as a cautionary tale in more ways than one, with Matt Damon and Ed Norton in a mad dash to make some cash in illegal high-stakes games. Perhaps the biggest lesson, one learned the hard way by the duo, is when Norton’s character “Worm” is caught dealing from the bottom of the deck. Not only is he caught red handed but he’s playing in a game with a bunch of New York state troopers. Needless to say, it doesn’t go over well for the cheaters, who lose some teeth and their entire bankroll. Lesson: Don’t cheat. Ever. Especially against a bunch of dirty cops. 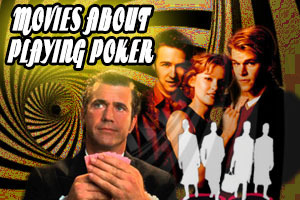 It seems 1998 was a popular year for poker films, catching the Texas Hold’em craze. In this British heist flick from director Guy Ritchie, poker serves as the catalyst for the rest of the film with a group of friends bankrolling their poker-playing buddy, who falls victim to a fixed high-stakes game held by the infamous "Hatchet" Harry. Mayhem and hilarity ensue as they try to pay off their debt to the intimidating gangster, but they could have avoided this mess had they played in a regulated and legal casino. Lesson: Be cautious where you play. Do your research before going all in. This Western was headlined by Mel Gibson, before he went off the deep end, and starred James Garner and Jodie Foster. Gibson and Garner went toe-to-toe for Foster’s affections, all the while getting conned by her flirtatious character Annabelle Bransford. She plays her way to the final table of a high-takes five-card draw tournament, hosted by the scene-stealing James Coburn, and holds her own against the top players before bowing out. In a movie packed with guff gunslingers and fast talkers, Foster’s Annabelle plays the damsel in distress but is really the snake in the grass. The James Bond reboot, starring Daniel Craig as a grittier and damaged 007, takes place at a mega high-stakes Hold’Em tournament in Montenegro, where Bond is tracking terrorist financier Le Chiffre, who has a particular tell: he cries blood. Bond actually has to buy back into the tournament after getting schooled by Le Chiffre with four Jacks over his full house but eventually figures out his opposition, scoring a $150 million pot with a 4-5-6-7-8 spades straight flush over Le Chiffre’s full house. Bond didn’t even need to invoke his license to kill, thwarting a terrorist plot and saving the world with a single poker hand. Lesson: Study your opponents betting habits/tells.